Pretty much everyone in America knows that America’s entrance into WW2 was prompted by a sneak attack by the Japanese upon Pearl Harbor and other American bases throughout the Pacific. What most people don’t know is that the German attack on Poland 71 years ago today also occurred prior to an official declaration of war. (An odd concept in and of itself, really.) The combination of the Luftwaffe and the Panzer divisions of the Nazi army quickly forced their way through the initial Polish defensive lines, primarily because of numerical and technical superiority — the Polish Air Force was primarily made up of 10 year old aircraft and the Army had only 140 of their most modern tanks (which were actually better armed than the German Panzer I and Panzer II). The Polish defensive plan prior to the war was for a slow, tactical withdrawl to allow their allies, the British and the French, time to come to their aid. However, the lack of natural defenses left them thinly spread and unable to mass enough of a military presence in front of any of the three primary routes of attack the Germans took. Within 2 weeks, the 400 plane Polish Air Force was reduced to 54, though nearly 100 pilots and planes were able to withdraw from combat through Romania. Many of them made their way to Britain where they joined the RAF and were some of the most successful pilots during the Battle of Britain — evidence of the high level of training and skill that they possessed. 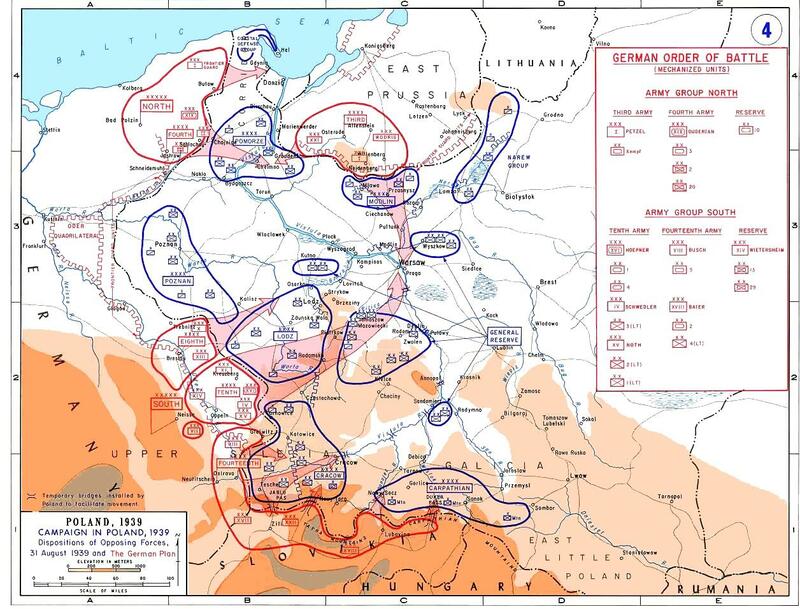 After initial retreats, on September 9, the Polish Army counter-attacked along one flank as the Germans besieged Warsaw, and had some initial success before the German air superiority overwhelmed them. The 10 days of the Battle of Bzura were key in allowing other Polish forces to reorganize themselves and also allowed much of the Polish government and military high command to safely withdraw to the south and then to exit the country and make their way to Britain to set up a government-in-exile. Despite being overwhelmed, the Polish military was preparing to make a significant defensive stand along the southern border with Romania. But on September 17, the Soviet Union invaded from the east, unveiling the Molotov-Ribbentrop Pact to the world. This was the deciding factor in Poland’s decision to defend itself — the government ordered all remaining members of the military to escape the country to try to reform in Britain and France. Warsaw fell on the 28th and the final active military resistance efforts were defeated on October 6. But despite the defeat, the Polish government never surrendered. As such, it was the only non-neutral nation in Europe which did not either surrender to or collude with the Axis powers. And despite the short duration of the fighting, the Polish military inflicted a significant amount of damage upon the Germans — though it lost over 300 airplanes (most of which were outdated), the Air Force destroyed or damaged over 500 of their German counterparts and the Germans sustained almost 50,000 casualties (16,000 of which were KIA) and lost one quarter of the 2,750 tanks they had used in the invasion. In comparison, the German invasion of France, a fight between much more evenly matched militaries only lasted a week longer, involved more than twice as many soldiers on the German side alone (over 6 million total between Germany and France), and resulted in 150,000 German casualties, 1,500 lost planes and 750 lost tanks. One of the most persistent myths about the German invasion of Poland is that the Polish military was so outdated that horseback cavalry attacked tanks with swords. The truth of the matter is that both Germans and Soviets also employed horseback cavalry and that all three militaries generally used them as dragoons (soldiers that traveled by horseback, but actually fought on foot). The myth itself was based on an event during the Battle of Krojanty, when Polish cavalry armed with rifles and sabers who had attacked German infantry were ambushed by armored vehicles. And on a related note, September 1 also marks the halfway point for the Warsaw Uprising of 1944 in which the Polish resistance — the Home Army — attacked the German military which was in control of the city. It was intended to be a coordinated effort in which the Soviet army would attack the German forces from outside the city and in which the RAF, South African Air Force and USAAF would provide supplies and reinforcements by air drop. But the Soviets refused the RAF and USAF permission to land on Soviet air fields to refuel and stopped their advance on Warsaw, leaving the resistance fighters to fend for themselves for just over two months. Two days after September 1, 1939, The United Kingdom and France both declared war on Germany. The German goal in invading Poland was Lebensraum — space for Germany to expand its Nazi population, a greater source of natural resources and a region to serve as a buffer against any possible aggression from Soviet Russia. But through a combination of international alliances and changing internal foreign policies (e.g. the shift in Britain away from appeasement), it initiated a massive continental war between a multitude of nations that when combined with the Japanese invasion of China in 1937 and their later attacks on other nations in the Pacific led to a truly global war. September 1, 1939, is, in my mind, the single most significant day in the last 100 years. Next PostNext The perfect post-breakup song?